A lot of products, including toothbrushes, rely on the physical testing of prototype after prototype to help perfect a design. But it’s an expensive and time consuming process, so researchers at the Fraunhofer Institute have developed a virtual brushing simulator that promises to revolutionize how toothbrushes are designed and tested. Engineering a toothbrush that can effectively wipe away the biological film that’s constantly growing on our teeth is easy. The complicated part is designing a brush, and bristles, that don’t also scrub away tooth enamel in the process. Testing a new brush design requires a careful combination of artificial teeth, toothpaste, and brushing technique, and determining which was responsible for a given outcome in an experiment can be tricky. But the software simulator, developed by researchers at the Fraunhofer Institute for Mechanics of Materials IWM, makes it impossibly easy to determine the effectiveness of individual parameters. 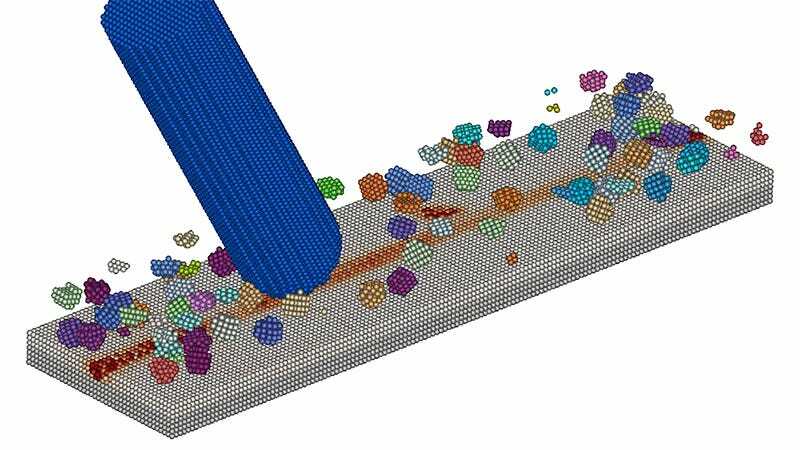 The size, shape, and elasticity of a toothbrush’s bristles can be precisely modified and tested in the simulator, but so can the size, shape, and quantity of the abrasive particles in a toothpaste. Highly controlled experiments can be conducted in the simulator allowing toothbrush designers to almost instantly determine how effective a new bristle design is at removing dirt while still preserving tooth enamel. But because toothpaste is an essential part of proper dental hygiene, also determine how it can be improved to maximize the effectiveness of a brush and a brushing routine. So in the future when a commercial for a new toothbrush promises it to be effective at battling plaque and gingivitis, hopefully its creators will be able to show the simulated results backing up their claims before you make the upgrade.